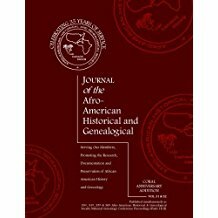 The Journal of the Afro-American Historical and Genealogical Society is a semi-annual publication of the Afro-American Historical and Genealogical Society, Inc. It provides a medium for the publication of original manuscripts, articles, and information on African and African American history and genealogy. The Journal is committed to documenting and preserving the African and African American experience by publishing historical and genealogical subject matter of interest to the African American family researcher, and facilitating the dissemination of historical and genealogical resources that will assist the African American family researcher.